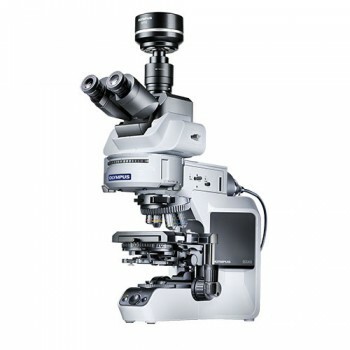 The BX43 upright microscope, the successor to the esteemed BX41, offers enhanced user operation and improved optical versatility. The new BX43 Motorised upright microscope can be equipped with any or all of the following motorised accessories: a motorized objective nosepiece, a motorised fluorescence filter cube turret, a motorised transmitted light condenser and a motorised attenuation wheel for fluorescence excitation. A handset or optional software control permits the synchronous operation of the motorized accessories for accurate and easy microscope operation. New binocular and trinocular observation heads enhance the ergonomics and operation of a BX43 microscope. Choose between tilting and traditional configurations. The new light intensity management feature coupled with new, encoded objective nosepieces controls light intensity as observation magnification changes. The new LED light source offers superb colour reproduction from purple to cyan to red, with ultra-long lifespan.